Ever wonder why your friends are faster than you? It may be because they have waxed their board. Waxing is an important and sometimes overlooked part of snowboarding. Not only does it make you faster helping you get across flats and be the first to the bottom, but it is also important for protecting your base. Here are our top seven waxing tips to get you started and keep you gliding. Use the right tools – Any waxing kit should have the following tools in it. It’s worth investing in these items as it will save you tonnes just waxing yours, your families’ and friend’s boards at home. 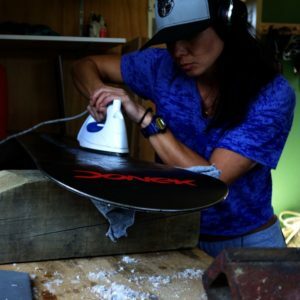 – An Iron – A snowboard waxing specific iron is best, but an old one works too. Prep your board – A lot of people will wax with the bindings tight, this will pool the wax where the bindings lay. Be sure to loosen your bindings before you start waxing. Another good habit is taking off the burrs on your edges. This can be done with diamond stones. Although it won’t sharpen your edges, it will make them faster going through the snow and help smooth your ride. There are three grades; course, medium and fine. Go through all three on your heel side and toe side edges, be sure to wet them with water first too! Choose the right wax – Getting an all temp wax is like running all season tires, it might be OK for some conditions but it hardly covers you for when you want to go fast at extreme and changing temperatures. It helps to make sure you are waxing to the right temperatures. A very general guide would be to assume the snow is a few degrees colder than the air. Clean your base – This can easily be done by using inexpensive non-fluorinated wax. Melt the wax into your base and scrape it while it is still hot. We suggest this over base cleaner because base cleaner can be harsh on soft bases, like ours, and eat at them. Although this process of hot wax cleaning may be more time consuming, it’s worth the extra time. Use Brushes – Brush the board with a course brush before you wax using short pressured strokes. This will help get gunk out of the pours so the wax can get into the base more effectively. Also use a brush after you scrape the board to do the same thing. The board will run faster if you brush it as a finisher. A shiny base is a fast base. Wax in straight lines – As tempting as it is to wax in circles, make sure you wax in straight lines, normally three iron widths for a snowboard, from tip to tail for racers and for three passes. For those who like to ride switch do the second pass from tail to tip. The passes should be steady and not too slow so you don’t cook your base. 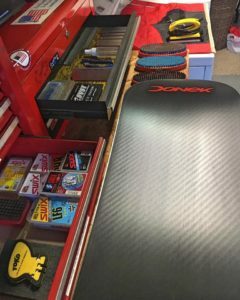 Get a hot box – For those living in dryer areas, like Colorado, it’s a good idea to spend the money at a tuning shop and get your snowboard hot boxed. This is when your board sits in a heated box for an extended time so wax can seep and set into your base. This will help prolong the life of your board and avoid those white strips on your heel and toe edges called edged burn. There is no way of coming back from that, so protect yourself.